It is a hot, humid and ridiculously gusty spring afternoon at White Rock Lake. I wait at the lake’s edge and am surprised when a woman extends her hand and asks for help out of the water. I panic. She’s submerged in the yucky waters of White Rock. I reach to rescue her and soon learn that, a) she is willingly in that water, and b) she is part of the crew that the Advocate is there to interview and photograph — a group of kayakers training at White Rock Lake for the world’s longest river race, the MR340 (that’s 340, as in miles). And here’s the crazy part: moments later, I am in her outrigger, paddling wildly against the waves (yes, 40 mile-per-hour winds cause powerful surf) and covered in water. Flottman, who has recently moved from the White Rock Lake area to Louisiana, returned to his roots for a weekend to mentor and advise four White Rock-area residents training for the July 2011 event. Steve Mahelona is an experienced kayaker, but his longest race to date has been about 18 miles, so he has some work to do before tackling the 340. Fortunately, he’ll be riding with experienced long-distance paddler Dan Grubbs. Mahelona’s wife, Stacie, the aforementioned lady in the water, is ground support for team Hui Hoola, a Hawaiian term for “team” and “heal”. Through the race, Team Hui Hoola is raising money for Susan G. Koman for the Cure. The Mahelonas, who met while racing outrigger canoes, have a personal connection to the cause. “Just after we got married, we found out I had breast cancer,” Stacie Mahelona says. “See, I am just now getting my hair back,” she says, pulling the cap from her head to reveal a shock of in-progress caramel-colored locks. Steve Mahelona says he’ll tackle the distance in pieces. Neighborhood residents Emily Loerke and her friend, Emily McKeaigg, comprise another team training for the 340 in their kayak, River Rocket. The athletic women run and cycle, but this is their first hard-core experience with paddling. The Emilys, like the Mahelonas, are raising money, but in a different vein. McKeaigg and her husband spent years struggling with infertility before deciding to adopt a child. But the expenses run into tens of thousands of dollars, so Loerke, being a die-hard friend, hatched the plan to ask friends, family and readers of her blog, todaysletters.com, to each sponsor one mile of the race for $15. At 340 miles, that would bring in $5,100 toward the McKeaiggs’ adoption efforts. When they hit that goal, Loerke celebrated. They are still working to raise additional funds toward race expenses. Only about two-thirds of the 300-team field actually finished the race. Flottman was one of them. The winners finished in about 40 hours, he says. McKeaigg and Loerke are eager to learn. “We are a blank slate,” says Loerke, referring to her lack of kayaking experience. Stephen Mahelona says hearing someone with experience, such as Ned Flottman, talk about the race helps ease his anxiety — even when Flottman is regaling them with stories about kayakers enduring hallucinations after a day or two on the water sans sleep. “Some of the frontrunners who go straight through say they see dancing bears and cars driving on the river,” Flottman tells the group of paddlers circled around him on the grass near the Mockingbird Bridge. He describes the fear he felt during the first 50 miles. When he made it into the second night, he remembers a “magical” scene where the boat lights against the pitch-black sky “looked like a string of pearls”. He also remembers a couple hundred miles in, sitting in his boat, exhausted, after losing his bearings. So he just sat, and shortly three guys showed up to help him. A steady stream of runners, in-line skaters and cyclists on the White Rock trail is the norm, but more athletes are getting into the water these days, by way of kayak or canoe. 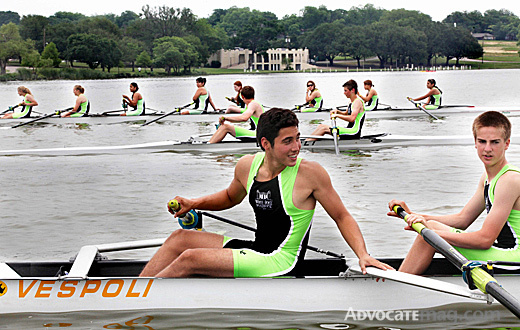 Area schools even offer rowing as a physical education credit, and students from throughout the greater Dallas area have joined the competitive White Rock Boathouse Juniors Crew Team. 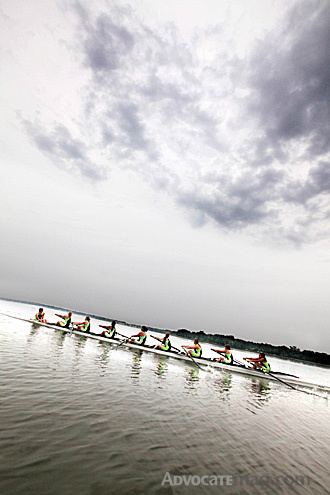 The team will host weeklong row camps for beginners all summer. New sessions start June 20 and 27, July 18 and 25, and August 1 and 8 for students entering the eighth grade and older. The camp is $75, and need-based scholarships are available. This is a good opportunity to see if your youngster takes to rowing, says mom Monette Irwin, whose daughter Alex rows on the WRBJ team. “Alex has found a sport she is passionate about, she is getting into great shape and she is having fun,” Irwin says. “And it is so beautiful to watch those boats glide across the water.” Interested? There is also an opportunity to check out the row team on National Learn to Row Day, June 4 from 10 a.m.-1 p.m. at the boathouse at White Rock Lake. Register for a summer session at wrbjuniors.com/summer-camps.